Taste test: These chips have a much different taste than any chips I've ever tried. I was expecting them to taste like Buffalo wings, but they really don't. There's some sort of seasoning in the taste, but it's not a hot buffalo wings-like taste, and the strongest taste is the ranch dressing. 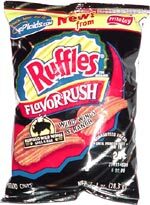 Despite this, they're good chips  very crisp, with wide ridges and a good crunch. If you're looking for real Buffalo Wings taste in a chip, I'd go with Lance Chip Thunder. Smell test: Sort of a ranch dressing-like smell, with some other spices mixed in.